I thank God for this opportunity, in the context of the World Meeting of Families, to visit this Shrine, so dear to the Irish people. I thank Archbishop Neary and the Rector, Father Gibbons, for their warm welcome. In the Apparition Chapel, I lifted up to Our Lady’s loving intercession all the families of the world, and, in a special way, your families, the families of Ireland. Mary our Mother knows the joys and struggles felt in each home. Holding them in her Immaculate Heart, she brings them with love to the throne of her Son. As a remembrance of my visit, I have presented the Shrine with a golden rosary. I know how important the tradition of the family rosary has been in this country. Who can tell how many hearts, of fathers, mothers and children alike, have drawn comfort and strength over the years from meditating on Our Lady’s participation in the joyful, luminous, sorrowful and glorious mysteries of Christ’s life! Mary our Mother is also the Mother of the Church, and it is to her that we commend today the journey of God’s faithful people on this emerald isle. We ask that our families be sustained in their efforts to advance Christ’s Kingdom and to care for the least of our brothers and sisters. Amid the storms and winds that buffet our times, may they be a bulwark of faith and goodness, resisting, in the best traditions of this nation, all that would diminish our dignity as men and women created in God’s image and called to the sublime destiny of eternal life. May Our Lady also look with mercy on all the suffering members of her Son’s family. 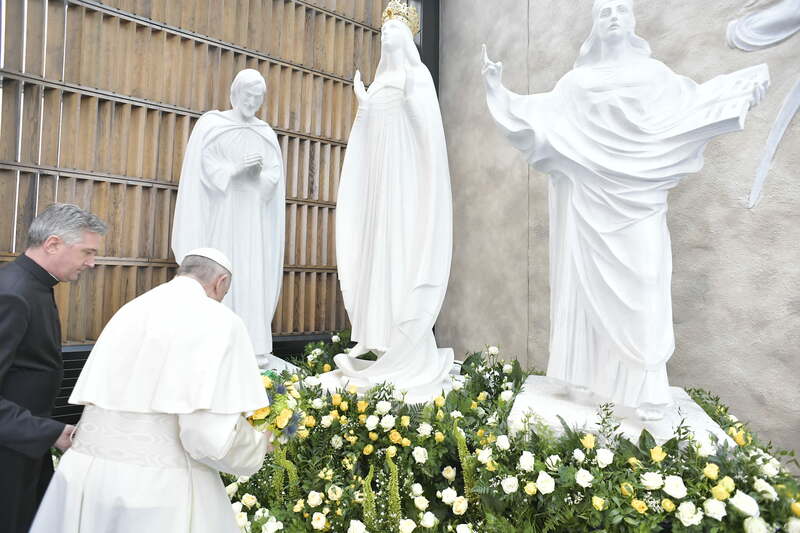 In my prayer before her statue, I presented to her in particular all the victims of abuse of whatever kind committed by members of the Church in Ireland. None of us can fail to be moved by the stories of young people who suffered abuse, were robbed of their innocence and left scarred by painful memories. This open wound challenges us to be firm and decisive in the pursuit of truth and justice. I beg the Lord’s forgiveness for these sins and for the scandal and betrayal felt by so many others in God’s family. I ask our Blessed Mother to intercede for the healing of the survivors and the betrayal experienced by so many in the family of God. I ask our Blessed Mother to intercede for every person who has survived abuse of any kind and to confirm every member of the Christian family in their firm resolve to never permit these situations to happen again, and also to intercede for us all, so that we may always go forward with justice to repair, as much as we can, so much violence. My pilgrimage to Knock also allows me to address a warm greeting to the beloved people of Northern Ireland. Although my Journey for the World Meeting of Families does not include a visit to the North, I assure you of my affection and my closeness in prayer. I ask Our Lady to sustain all the members of the Irish family to persevere, as brothers and sisters, in the work of reconciliation. With gratitude for advance of ecumenism, and the significant growth of friendship and cooperation between the Christian communities, Muslims, Jews and those of other faiths: sons and daughters of Ireland. I pray that all Christ’s followers will support the continuing efforts to advance the peace process and to build a harmonious and just society for today’s children. Now, with these intentions, and all the intentions hidden in our hearts, let us turn to the Blessed Virgin Mary in the prayer of the Angelus.